Eating on the cheap isn’t easy in New York City, but thankfully, there are still a few neighborhoods where you can eat like a king with just a Lincoln in hand. Chinatown is one of them, with what is perhaps the greatest selection of snacks and full-fledged meals for less than a subway ride. 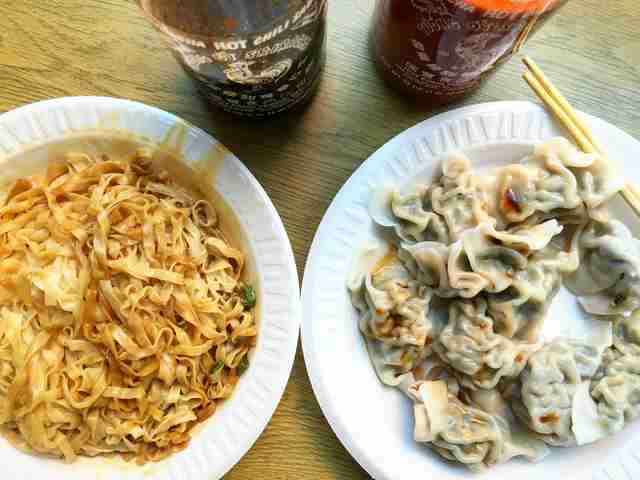 From fried chicken over rice, to mango smoothies, to sesame pancakes with Peking duck -- and of course, dumplings -- here are 18 spots in Chinatown where five bucks (or less) goes a long, long way. Owner Kyo Pang has recreated the snack of her childhood at this pint-sized cafe, where traditional Malaysian snacks are finally getting their due. The time-consuming process of making kaya -- a fragrant, pandan-scented jam that’s pastel green in color -- pays off when her toasted sandwich arrives at the table. 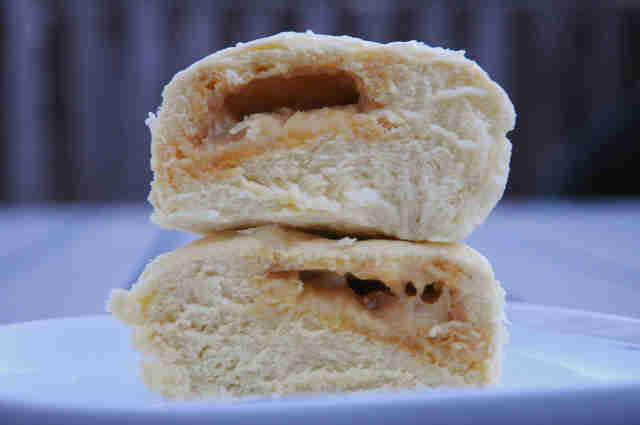 The fluffy slices are glued together with a schmear each of kaya jam and butter, resulting in a delightful sweet and savory treat. For one of the cheapest, most satisfying meals in town, look no further than this no-frills shop slinging Taiwanese staples. 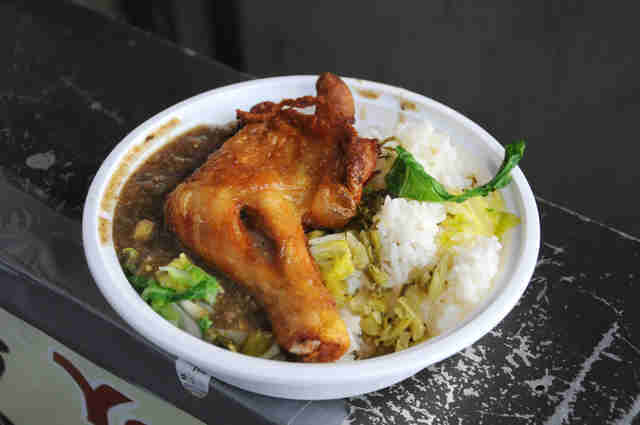 Each plastic container is packed to the brim with rice, pickled vegetables, creamy pork sauce, and a whole chicken leg deep-fried to golden, juicy perfection. 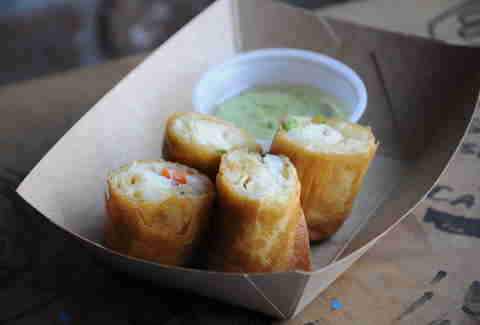 The fusion spring rolls at Samantha Chu’s brick-lined hangout put most others to greasy shame. Each order arrives with two crackly shelled batons stuffed with Asian-inspired combos, like the standout samosa with curry-scented potatoes, carrots, and peas. Choose from four house-made dips, such as a bright and creamy chimichurri or Thai chili-spiked “crack” sauce. A spiced-up version of the dim sum staple, this hefty pile of silky rice rolls arrives with an addictive topping made from ground pork, mushrooms, pickled peppers, and smoky XO sauce. 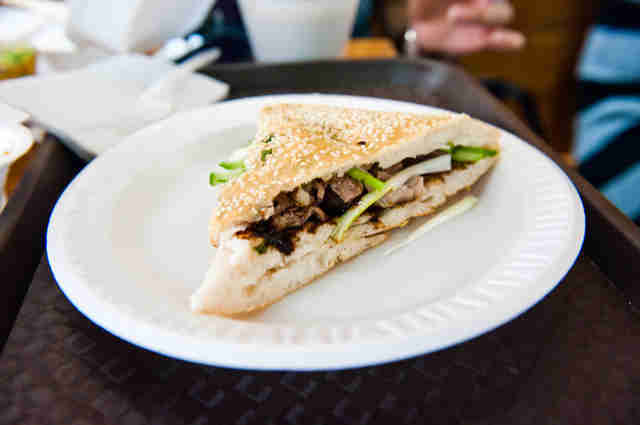 At one point or another, every broke and hungry college student has made a trip to Vanessa’s, where the dumplings are great (and cheap), but the real star is the sesame-studded flatbread sandwiching hoisin-tinged Peking duck and shredded cucumbers. Lines constantly build at this barebones joint, and for good reason. Even the “small” size here equates to a heaping cup of rice piled high with char siu, cabbage, and the crowning glory: a ladleful of the meat-flavored elixir that once held the succulent pork -- all of which clocks in at $4. In other words, it’s a whole meal for less than what most places charge for an iced coffee. And if you’re still hungry afterwards (you won’t be), be sure to try the crispy Peking duck -- we assure you, you will not be disappointed. Your first instinct may be to go for the meaty skewers at this East Broadway shop under the Manhattan Bridge, and you should trust that, but don’t overlook the pancake: a griddled-then-grilled puck that’s covered in the same lip-tingling spices and smoky char as the skewers. With over a dozen varieties to choose from (and most clocking in at under a buck), this pint-sized bakery on Mott is a one-stop shop for fueling up on the cheap. 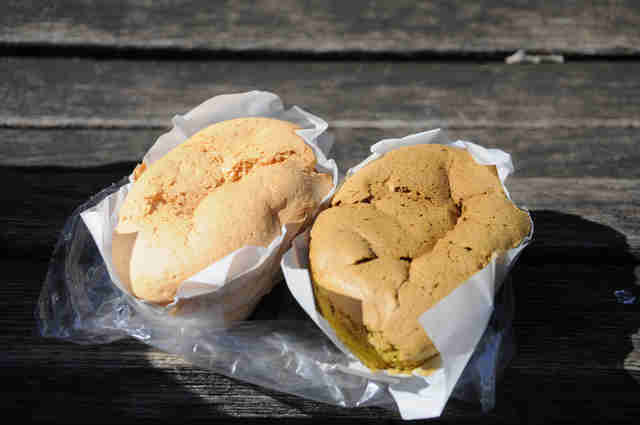 The impossibly fluffy buns are packed with various sweet or savory fillings, but we’re partial to the oozing salted egg yolk and roast pork. 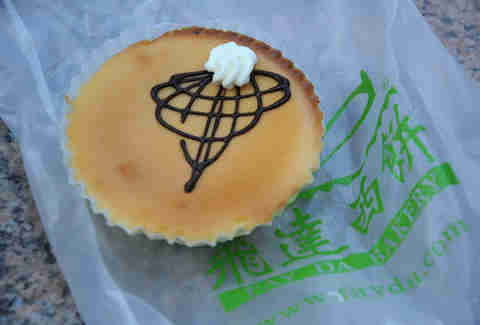 Nestled among shelves of Chinese buns and rolls at Fay Da Bakery, you’ll find a surprisingly good mini cheesecake that’s creamy, tangy, and at under $2 a pop, affordable enough to warrant ordering more than one. 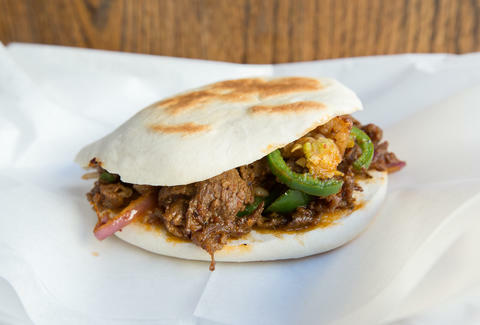 The meat-stuffed “burger” at Jason Wang’s rapidly growing chainlet isn’t just one of the best bites in Chinatown, it remains one of the top sandwiches in the city, with its toasted bun packed full of succulent strips of cumin-dusted lamb. Bubble tea joints are to Chinatown what Starbucks is to the rest of the city, so this tropical slushy is a refreshingly welcome alternative. 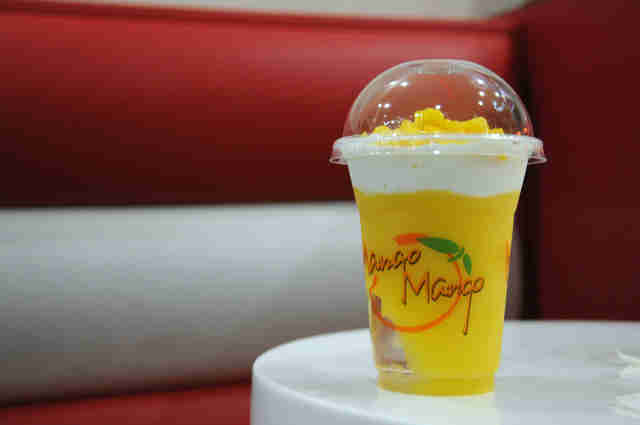 The 16oz sipper is essentially a mango smoothie topped with creamy coconut milk and chunks of fresh fruit, great as a drink or dessert. 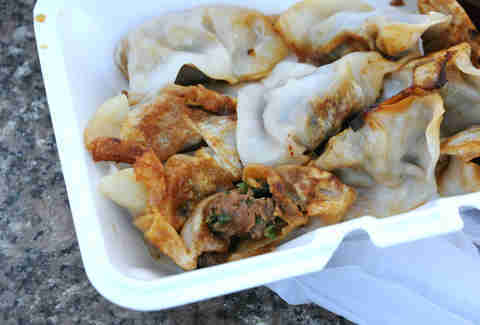 The word “noodle” may get star billing at Lam Zhou, but the pork and chive dumplings are more than just a supporting act. Whether fried or boiled, the potstickers are always deliciously juicy -- and at 10 pieces an order, they’re a filling meal all by themselves. 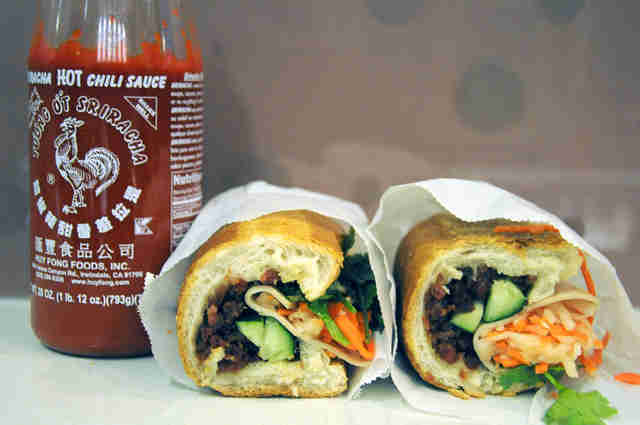 From the crusty baguette to the chunks of roast pork and crunchy pickled veg, each element plays a crucial role in forming the ideal bánh mì at this jewelry store-slash-cafe on Grand. It’s a hefty sandwich that will leave you plenty full for just $4.50. It’s hard to stop at just one tart after you get your first bite of quivering custard nestled within this buttery, flaky pastry shell, but thankfully a single order comes with two (for less than two dollars!). 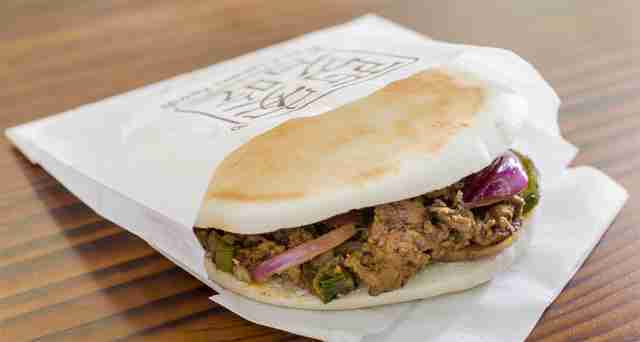 Eight years in and this Japanese-meets-Taiwanese cafe has yet to raise the price of its signature item. 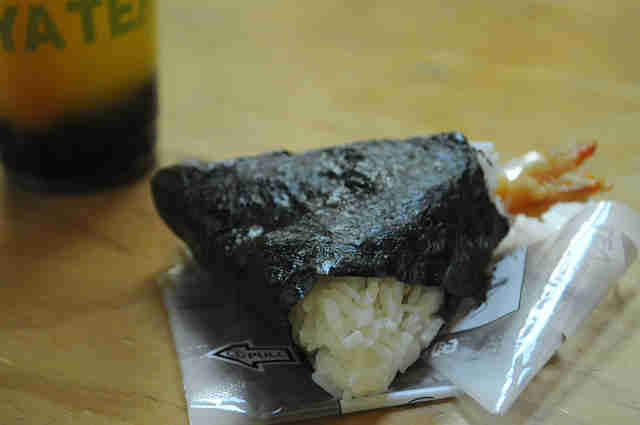 Even a small size of the shrimp tempura onigiri feels hefty and filling, and two can easily take it from a snack to a meal. Most of the signature bubble teas are priced to match, which means a rice ball and drink will still only set you back five bucks total. 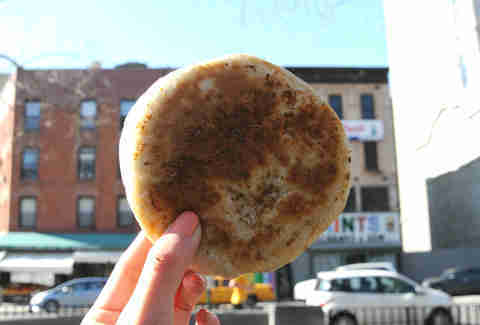 Along with a new space right across the street from the old one, the bakery has expanded its lineup to include a variety of trendy flavors -- green tea, peanut butter chips, and even pumpkin spice -- but none are a match for the eggy, light-as-air original, coming in at just 75 cents. 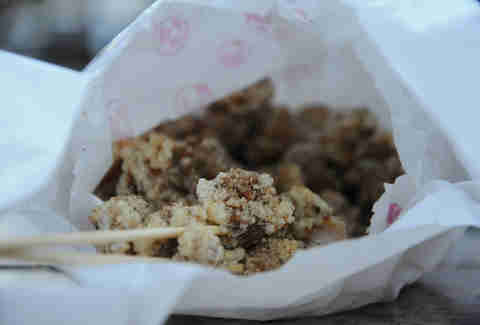 This bubble tea chain serves up a mean bag of fried chicken. Each dark meat nugget is coated in a delicious spice mix, with the option to amp it up with curry or basil (though our favorite is the standard pepper/salt mixture). Peanut butter lovers, this is the dish for you. 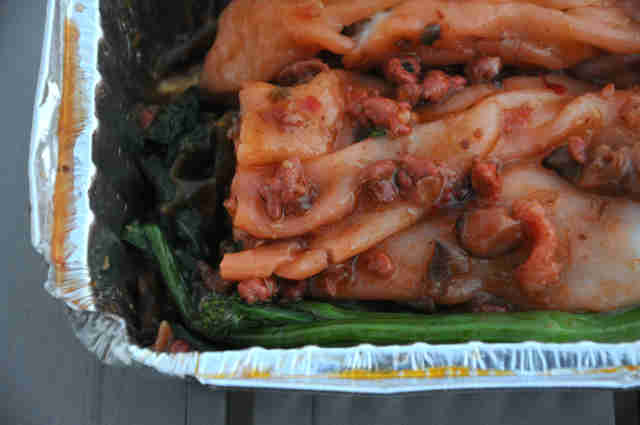 For less than the price of a subway ride, you can score a large Styrofoam plateful of chewy, wavy noodles coated in a gloriously messy peanut-soy sauce. Patty Lee is a reporter and editor who has written for Zagat, Time Out New York, New York Daily News, and Cooking Channel. 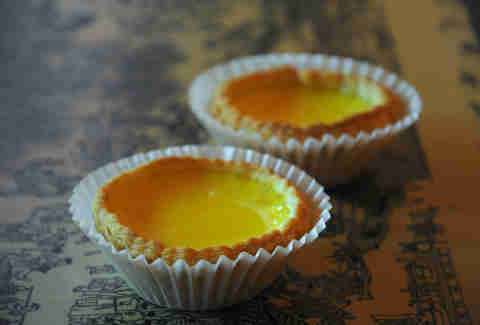 She’s been known to buy egg tarts by the dozen. Follow her on Twitter and Instagram.